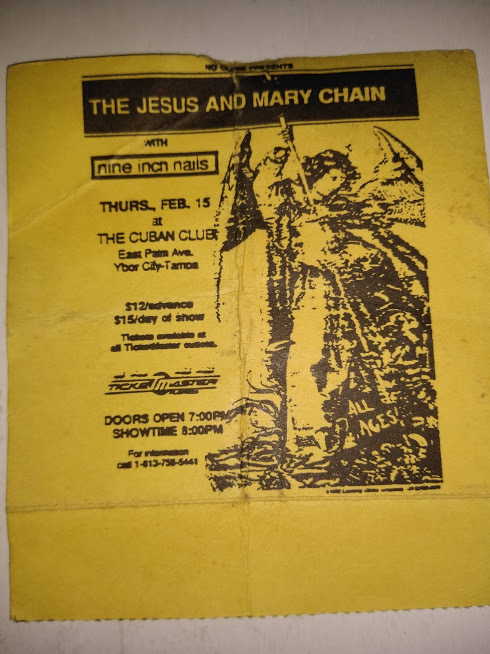 There was a FaceBook group where Dave posted about this show and someone spotted this and told them to get a hold of me about it. So Dave contacted me and I was ELATED to see this! This is the firs time I have ever seen this show/source. Basically 28 years on, it is finally released to the masses. The recording is great for the time and it seems like NIN is having trouble to start the night as you can hear Trent say something like “sorry for the delay.” Which is why there is probably a longer intro. Here is a recollection from the taper, "This concert took place on a large stage in a big courtyard/plaza. The Cuban Club is a historic building which still stands. It was a social center for the Cuban community for decades and decades. A multi-story building with a courtyard, a basement, a ballroom and a grand staircase. Since this was mid-February in Florida, it was actually a pretty comfortable evening. What I remember most about this show was that Trent would randomly run over and smack his guitar player. I'm not sure if it was antagonism or just for visual. Everytime Trent hit him, white powder would fly off the guitar player in a cloud around him. Kinda like he was covered in baby powder or cocaine."